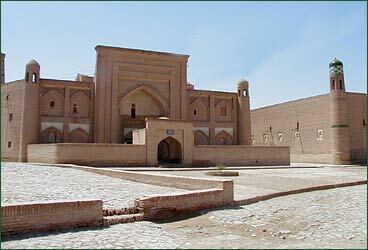 Khorezm has a very long history, only a few civilizations could be compared with it. Hundred years before the Great Silk Road appeared, ancient Khorezm had had links with Europe and the East, with Siberia and southern civilizations. It is a cradle of three civilizations formed in Uzbekistan. The Khoresm Khanate was very famous in the fourth century, BC. It was very powerful state. Fairy-tale like city Khiva has managed to retain its exotic image of an Oriental town in the older part of the city called Ichon-Qala. Ichon-Qala is a place where all the monuments of architecture are located. Among them there are the Kunya-Ark citadel and the Tash-Khauli Palace, residence of the Khan which had been preserved intact along with its ornate gates. Besides, Ichon-Qala displays simplicity and monumentality of medieval architectural forms, the delicateness of woodcarvings, and skilled interweaving of ornamentation. The silhouettes of its towering minarets, hemmed in by clay built houses with their flat roofs and surrounded by the fortress's powerful clay built walls, give a clear idea of a typical Central Asian feudal city. 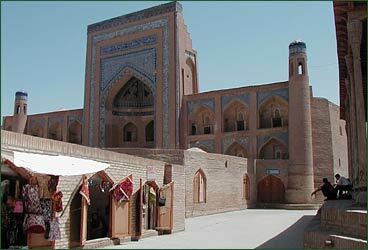 Billed as an "open air museum" Khiva is more than 2500 years old with population about 40 000 people. It's located on the territory of Kyzyl-Kum desert, 450 km. from Bukhara. In fact, Khiva is made up of madrasahs, mosques and minarets such as the tall and beautiful Islam-Khodja minaret, plus having the most number of minarets in Asia, the most remarkable being the Kalta-Minor minaret (1835) and it is still standing. The Djuma Mosque which has an amazingly 218 ornate carved wooden columns is another of the main attractions.